(Reuters) - Traffic growth on Baidu Inc's mobile app helped drive higher-than-expected third quarter revenue as China's biggest search engine operator places more emphasis on artificial intelligence (AI) and autonomous driving. Revenue rose to 28.2 billion yuan ($4.11 billion) from 23.49 billion yuan in the same quarter a year ago. That beat the average estimate of 27.53 billion yuan, according to Refinitiv data. 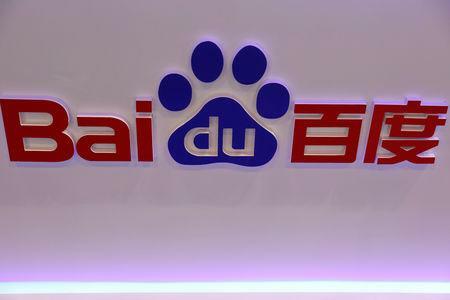 Baidu has been investing heavily in new business lines following tighter rules in China introduced in 2016 requiring search engines to make it clear which results are paid-for ads, but has said these projects may not help boost sales growth in the near term. Baidu's sales momentum has lagged technology peers Alibaba Group Holding Ltd and Tencent Holdings Ltd, and it has sold or closed several businesses over the past year which were in direct competition. Baidu forecast fourth-quarter revenue of 25.48 billion yuan to 26.72 billion yuan, lower than financial analysts' target of 27.69 billion yuan. At the same time, Baidu has become one of China's biggest names in AI, with its efforts endorsed by the government as well as international firms. This month, it became the first Chinese company to join an AI ethics group alongside members such as Apple Inc and Alphabet Inc's Google. "Baidu delivered a solid third quarter with impressive results from search, feed and new AI businesses," said Baidu Chief Executive Robin Li. He added that Baidu's AI platform DuerOS saw strong adoption and Apollo, Baidu's self-driving car technology, was now powering fully autonomous Apolong minibuses in over 10 locations. Baidu said its AI system blocked over 430 million medical ads to combat misleading and low-quality medical advertisements in the third quarter. The stricter rules on Chinese internet advertising resulted from the death of a student who underwent an experimental cancer treatment which he found using Baidu. Net income rose 56 percent from a year earlier to 12.4 billion yuan, the company said. Excluding gains from the divestiture of its financial services business, Baidu posted adjusted earnings per share of 19.01 yuan versus Wall Street expectations of 16.70, according to Refinitiv data. While the company said its Baidu App saw strong traffic in the quarter, its daily active user number dropped to 151 million in September from a peak of 161 million reached in August. The September number was up 19 percent year-on-year. Baidu's U.S.-listed stock was slightly lower following the results in after-hours trade on Tuesday. The stock is down over 20 percent since the beginning of the year amid a wider selloff of Chinese technology shares.